Teaching in Transnational Higher Education examines current trends and challenges that face students, teachers and institutions of higher education around the globe. 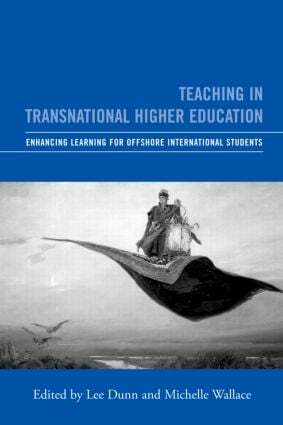 This book comes at a pivotal moment where many universities are offering their courses in offshore locations. Students who could once not access an international qualification can now do so without leaving their home country. The book clearly defines and takes an in-depth look at the various types of transnational education, including: institutions that have campuses abroad, teach specific courses abroad, and form partnerships with diverse schools to teach jointly. The authors choose to highlight a broad sampling of transnational programs including those in: Zambia, China, and the United Arab Emirates among others. Interviews with students and teachers participating in these programs of study make this an enjoyable and unique portrait of higher education that is invaluable to those who teach and learn around the world. Lee Dunn is a lecturer and academic developer in the Teaching and Learning Centre at Southern Cross University. Michelle Wallace is an Associate Professor in the Graduate College of Management at Southern Cross University.